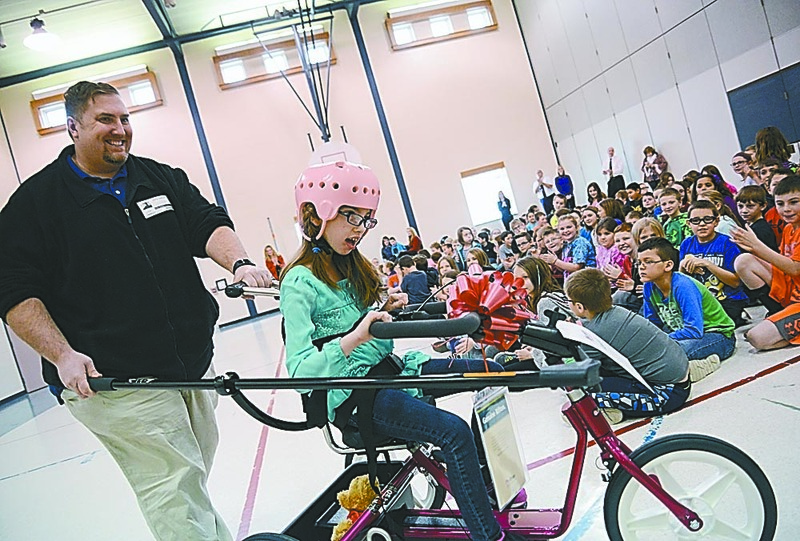 Mirror photo by Patrick Waksmunski Kayda Hinsch, 9, of Duncansville takes a ride on her newly presented adaptive bicycle around a group of her classmates as she is followed by her father, David Hinsch, during a presentation at her school Monday. Mirror photo by Patrick Waksmunski Frankstown Elementary fourth-grader Kayda Hinsch, 9, of Duncansville poses with her teacher, Anna Balouris, on her newly presented adaptive bicycle during a presentation at her school Monday afternoon. HOLLIDAYSBURG — Teacher Todd Russell of Hollidaysburg Area and other teachers across the county provided a special Christmas present for an area student Monday. Kayda Hinsch, 9, was all smiles as she rode a specially made bicycle at Frankstown Elementary School while her classmates cheered her on. With the bicycle specifically fitted to her needs, cerebral palsy and severe epilepsy no longer inhibit her from riding with her family and friends. And the bike can be adjusted as she grows, so it will benefit her for years. At a cost of $1,800, the specially made bikes for children with special needs are not reasonable for parents to buy, Russell said. The bike for Kayda was purchased by Blair County teachers with a $2,000 grant from the Pennsylvania State Education Association, and next year Russell plans to provide a specially made bike to one student in each school district in the county. 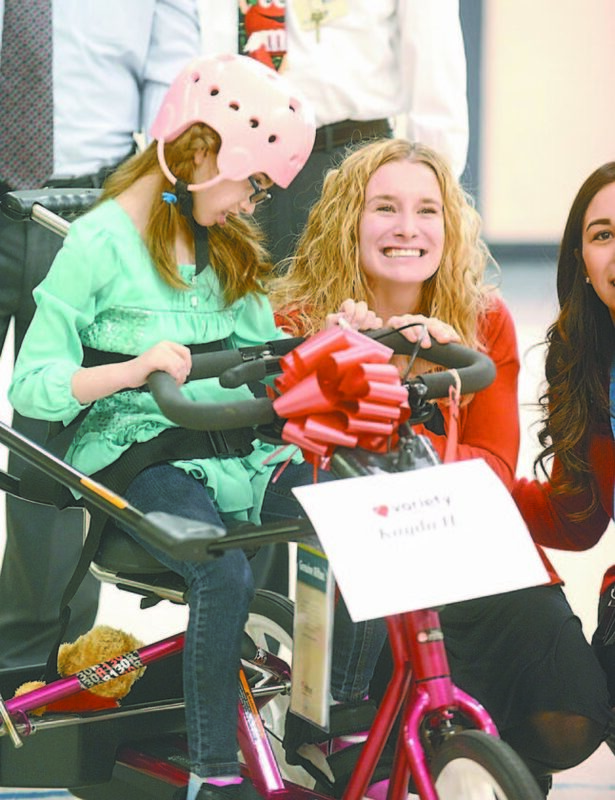 The bike project is only one of many charitable efforts of area teachers throughout the year. For several years now, teacher representatives of the PSEA who work in Blair County school districts have been meeting monthly to plan how to raise money to provide for those in need in the community. Russell, who has been teaching for 23 years, is integral to the teachers’ charitable efforts, said Lucy Harlow, PSEA Central Region spokeswoman. 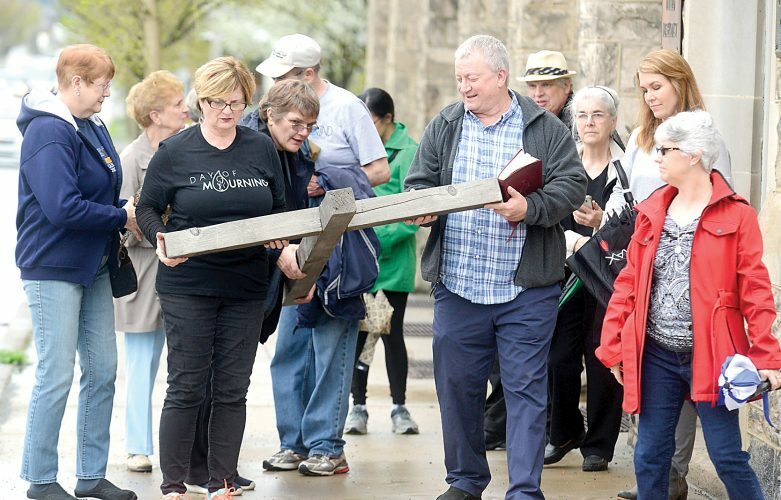 “He is an amazing man who has made connections all over the county in an effort to help others in need,” she said. The teachers of districts led by Russell also give books for newborn babies monthly at three area hospitals, UPMC Altoona, Nason Hospital and Mount Nittany Medical Center. Russell said he helps provide 3,000 books per year for newborn babies at area hospitals and has provided Nook readers to the Van Zandt VA Medical Center. “We got involved with Books for Babies because we believe that if we can get parents to read to their children when they’re young, those kids will be more likely to enjoy reading and will be better equipped to succeed once they get to school,” Russell said. The teachers have also purchased Nook readers and computers for the Van Zandt library. On Monday, Russell’s leadership in securing a bicycle for Kayda was appreciated by Kayda’s family, including her father, David Hinsch, and grandmother, Donna Carmichael. “It’s awesome,” David said. The bicycle can be adjusted to be a stationary bike that can be used indoors as part of her physical therapy routine.